Starting June 1st, fans will be able to log on to Speed51.com and cast their ballot. Only one vote per person per day will be counted and anyone with a computer will be able to make their choices known to the world. The winner of the award in both the Northern and Southern Modified Tours will receive $500 and a web design from 51 Sports (parent company of Speed51.com). The total prize package is worth $5,000 for each recipient. Speed51.com has become a leader in online Motorsports information by focusing on the Short Track Racing realm. 51 realized nearly five years ago that there was a void in the industry for news and behind-the-scenes stories. Now, 51 is viewed by thousands of fans per day. The site fuels your Short Track appetite for NASCAR's Grand National and Elite Divisions, both Modifieds Tours and much more. 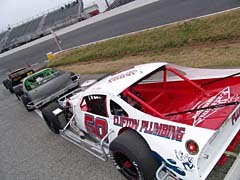 Speed51.com has extensive coverage of both Modified tours online and has found this open-wheeled form of racing to be one of the most followed racing series among short track fans. Plus, the website’s editor, Speed Channel personality Bob Dillner, holds a special place in his heart for this form of racing. Three words say it all – Most Popular Driver. It’s the award that everybody wants, but nobody really expects to be able to win and Speed51.com will be bringing it to the fans when it comes to NASCAR Modified racing in 2005. Speed51.com has teamed up with NASCAR to present the award for both the Whelen Modified Tour and the inaugural Whelen Southern Modified Tour in 2005. Fans will be able to vote online throughout the course of the season. 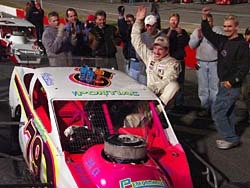 One of the most watched drivers in either division of Modified racing is Ted Christopher. Not many drivers can rile up fans quite like the former NASCAR National Weekly Racing Series champion. Ted Christopher will be a favorite to win the Northern Most Popular Driver.